Lincoln Surgical can provide genetic testing for appropriate women with strong family histories of breast or ovarian cancer. 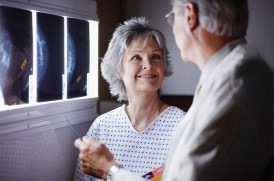 If you are referred to Lincoln Surgical for evaluation of a breast problem, we can perform a risk and genetic assessment to see if you should be tested for hereditary breast and ovarian cancer syndrome. Although most women do not fit criteria for genetic testing, women who do test positive can be offered more intensive screening, risk-reducing medication, risk-reducing surgery, and referral for formal genetic counseling. You can download our "Risk Assessment for Hereditary Breast and Ovarian Cancer Syndrome" to fill out prior to an evaluation at Lincoln Surgical. To learn more about genetic testing by Lincoln Surgical, please call 618.277.7400. Additional online resources are also available to help you better understand the genetic link.